Your child has broken (fractured) a bone in their forearm by falling onto their arm. There are two bones in the forearm, the radius and the ulna. When children break these bones, there can be two types of breaks. In greenstick fractures, the bones bend quite badly and partially break, but don't snap right through. In the other type, the bones break right through and get quite badly out of line. Because children's bones are still growing, doctors try to avoid doing an operation with plates and screws to line the bones up. Instead, they prefer to pull the bones back into line (giving the child a light anaesthetic) and plaster the arm to hold everything in position. Children's bones don't need to be perfectly aligned for them to heal. They have so much growing to do that their body manages to remodel the bones over time into a straight bone. 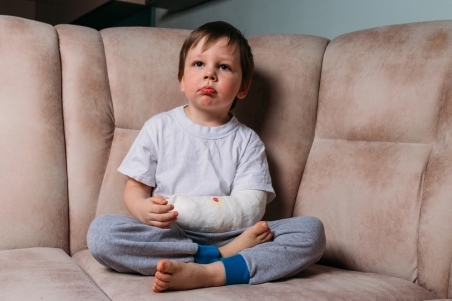 If the injury is more than 2 to 3 cm away from your child's wrist, in the middle of their forearm, or close to their elbow, the plaster cast will go up above their elbow. This stops their arm moving at the elbow, and keeps the break properly lined up. If the break is nearer their wrist, they might get a new cast, which stops below their elbow, a few weeks later. The plaster cast may have a cut in it to allow for swelling. The cut will be joined up either before your child goes home, or at their first visit to Orthopaedic Outpatients Department. At first, it's important to encourage your child to keep their arm raised up on pillows and to pump their fingers. This helps to decrease the swelling. Before your child goes home, they'll have an X-ray in the cast to make sure the break is properly lined up. Make sure your child has regular pain relief. Paracetamol or codeine is best. Your child should take them as the doctor has prescribed. You'll find more helpful information on the Care of your cast page. Please read it carefully. If you have any concerns, phone the Orthopaedic Outpatients Department, Christchurch Hospital on (03) 364-0800 ext. 88692 and ask to speak to a registered nurse. At their second or third visit to the Orthopaedic Outpatients Department your child's cast might be changed to a lighter, coloured one. We can't change the cast too early as this might make the broken bones move and cause some pain. Your child can go back to school once the pain has gone and their arm is no longer swollen (about a week after the injury). It's best to keep the arm in a sling, or collar and cuff to stop it being knocked while they're at school. Written by Orthopaedic and Paediatric Departments, Canterbury DHB. Adapted by HealthInfo clinical advisers. Last reviewed April 2018. Orthopaedic and Paediatric Departments, Canterbury DHB. Fractured radius & ulna: parent/caregiver information. 1 October 2008. Authorised by director of nursing, Christchurch Hospital. Ref 0201.